While some plants need constant water to survive, other plants can go without rainfall for years. These plants survive by storing large quantities of water inside them. The most famous is the cactus, but various other plants living in arid regions have developed this capability. Through various specialized structures, they can maximize the amount of water they can hold while also insulating themselves from water escape. Most plants store a small amount of water, which they use to maintain their form through water pressure. However, only some plants store excess water as an adaption to very dry regions. During rainfall, the plants often have roots spread out widely to collect water before it evaporates or leaches to a place where the water lacks availability. Plants that store their water put them in fleshy leaves, stems and roots. They are called fleshy because they have a swollen appearance. These plants have specialized tissues known as vacuoles to store water. While all plants have vacuoles, and all vacuoles store water, water-storing plants have specialized vacuoles that can store more water. The cells can also handle more dehydration than other species and can rehydrate themselves. Since leaves can often lose water, many of these plants can drop leaves to avoid water loss. A single rainfall can give cacti enough water to survive for years. Cacti are the main water storers. However, other species such as argaves, elephant trees, geophytes and some euphorbias also store water. Geophytes can store a lot of water in their roots. If they get dry enough, the top part of the plant will perish, but the bottom part of the plant will remain alive, and the whole plant will regrow when the area finally rains. Water-storing plants have wax on the surface, which prevents water from seeping out. The plants also carefully control their stomates so that water does not escape. Crassulacean acid metabolism allows the plants to keep their stomates closed during the day. 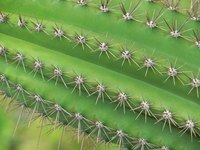 Given that animals struggle to find water in the desert, cacti and other water-storing plants can become common targets. Therefore, these plants use poisons or spiny points to deter animals. Some plants camouflage themselves. Other plants hide in regions that animals struggle to access. How Do Plants Survive in the Desert?